A cake without any cake! The best of everything in one. Previously, I’ve tried making multiple versions of this incredible dessert, but the results did not meet my expectations in one way or another. Many times it turned out a bit soggy, shrunk in size, or just not as fluffy as I like. This recipe can be very tricky to master. Most recipes I’ve made called to be assembled immediately before serving. This was very inconvenient because while other desserts and people are ready to eat, you had to take a considerable amount of time to assemble the Boccone Dolce. So, I set it aside for a while. At the end of the event, there were some leftovers so I took yet another piece with me. My husband’s experience was a bit different but eventually caught up to mine. He said it didn’t look attractive to him so he didn’t try it. Later that evening he took a bite of my third slice (how could I not let him..?) just to try what the fuss was about because we kept telling him how delicious it was and that he was missing out. Well, guess what happened next? He ate the entire piece that I so badly wanted. He kept saying that he couldn’t believe he missed out on such deliciousness during the event. This cake was extraordinary and different than all the previous ones I’ve tried. All the way home I thought, ‘No matter what, I must have this recipe!’ At home, my daughter left her piece in the fridge overnight and it didn’t change a bit. It was still firm, crunchy and fresh. So I contacted and asked the kitchen director to point me in the direction of who made this wonderful cake and that I really wanted to track down the recipe. Shortly after, I had it in hand. 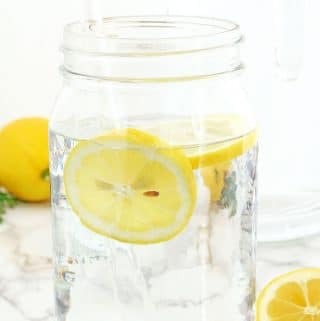 I really appreciate Tanya for sharing this recipe with me and her permission to share it with you. 1. Preheat the oven to 350 F. Place a 10” bottom piece of a springform pan on a sheet of parchment paper. 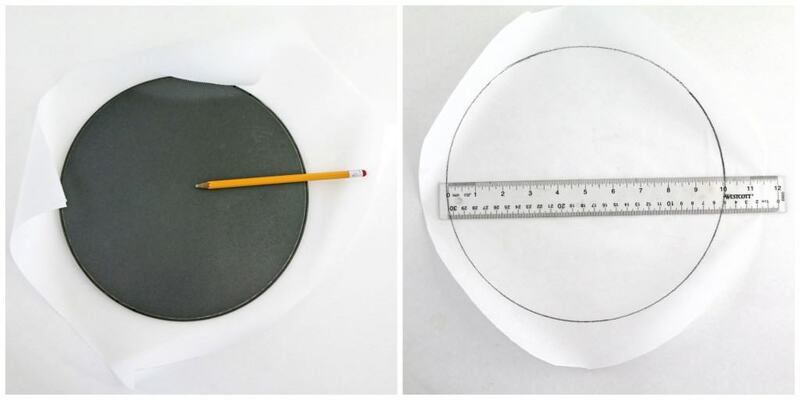 Trace the circle with a pencil. Cut out the circle 2” further away from the traced marking. Make 3 identical circular cut outs and set them aside. 2. Carefully separate egg yolks from whites. 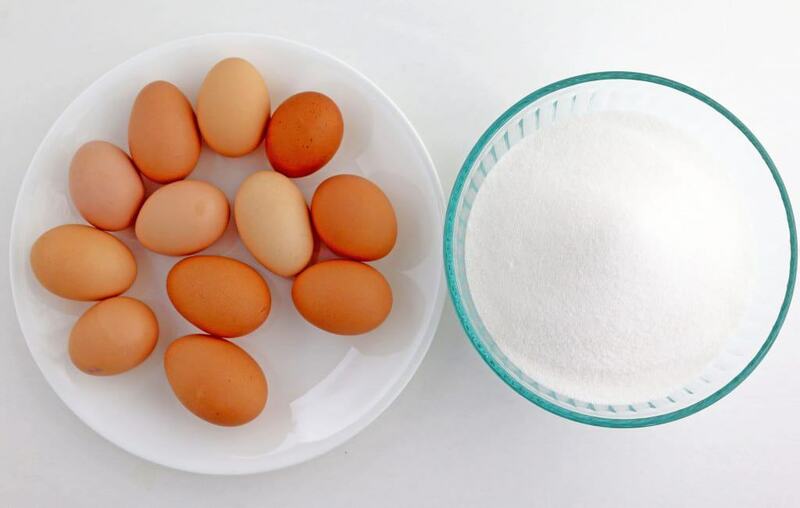 Place all 12 egg whites into an electric mixer bowl. Add sugar. Beat egg whites and sugar on high for about 15 minutes. (Speed 10 on a heavy duty 6000 HD Kitchen Aid Mixer. Beating times vary depending on the mixer you use.) The thickness of the meringue is very important. It should be very thick, heavy, and smooth (with no sugar granules). 3. Fill a piping bag with meringue, about ¾ full. Turn over the circular parchment paper cut outs (so the pencil mark is on the bottom side). Pipe meringue out in moon shapes (reversed letter “c”) overlapping each other to form a large circle along the visibly traced circle. Then fill in the middle. Level out the inside meringue, leaving the outer circle untouched. Repeat the same steps with all 3 parchment paper cut outs. 4. The top rack should be positioned in the middle of the oven and the second rack should be placed right under the top one. Placed meringue layers into the oven one at a time. (An aluminum insulated cookie sheet goes a long way to help you in this step.) Slide the cookie sheet gently under the parchment paper of one meringue layer. Carefully transfer it to the top oven rack. Repeat the same steps with the other 2 meringue layers and place them on the bottom rack. Immediately when all 3 layers are in the oven close the oven door and reduce the temperature to 270 F. (TIP: Temperature control is vital in the baking process and outcome.) Let it begin to dry (bake) at this temperature for 7 minutes, then reduce the temperature to 220 F.
Let it bake at that temperature for 6 hours. Once 6 hours are up, turn the oven off and let the meringue cool in the oven overnight. 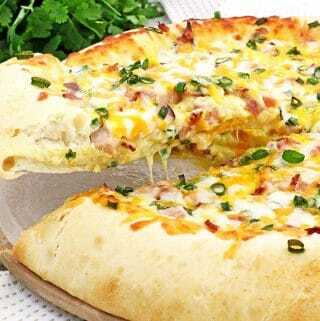 This step is very important: It must cool down very gradually – in the oven and with the oven. Removing it from the oven to room temperature is a drastic temperature change and will cause a lot of cracking. 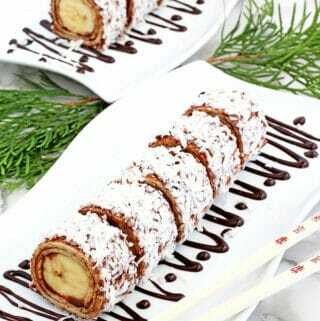 (To enjoy this dessert at the after church lunch on a Sunday, I begin making it around 5 pm, on a Friday before. Trim one of the previously used parchment paper cut outs along the traced circle and place on the serving platter to assemble the cake on. (This is optional but handy to prevent the platter from scratches during slicing). Spread a smidgen of cream under the paper to prevent the cake from sliding off. Place the first meringue layer on the paper. Spread about ¼ cup (70 g) of Nutella (you may use more or less, depending on how much you like). 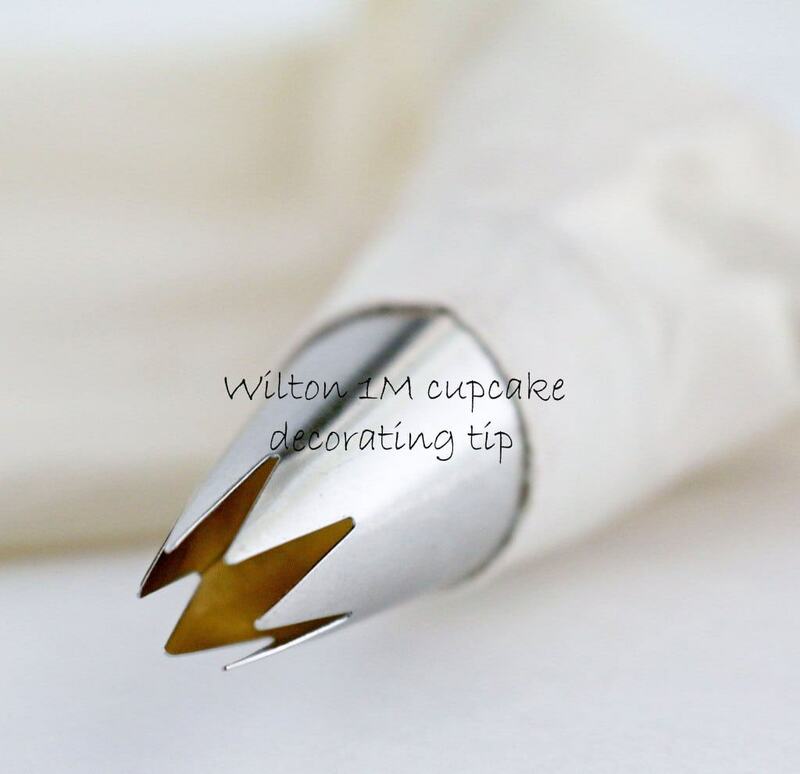 Fill about 1/3 of the cream into the same piping bag with the same tip you used to pipe meringue. Pipe out the cream in the same manner as the meringue layers. Fill in the middle and cover the Nutella. 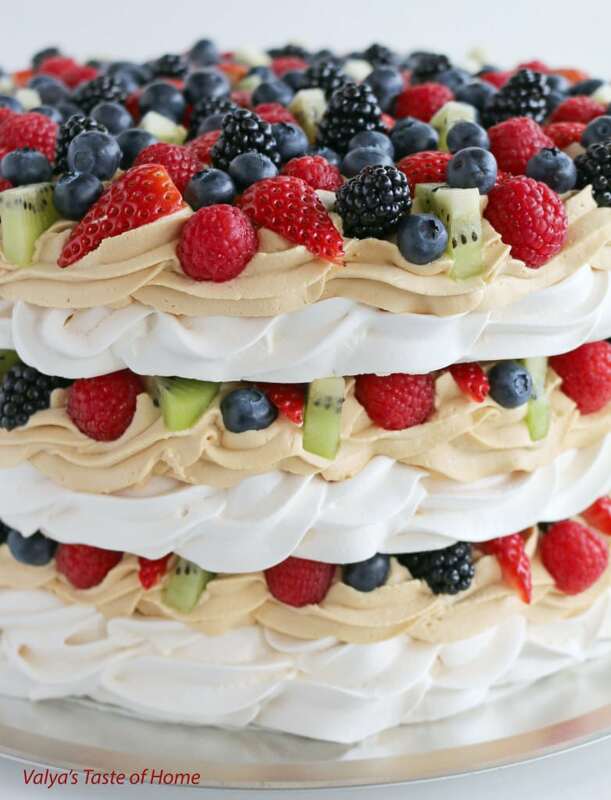 Spread out and mix up (rinsed, dried and cut) fruit on top of the cream. 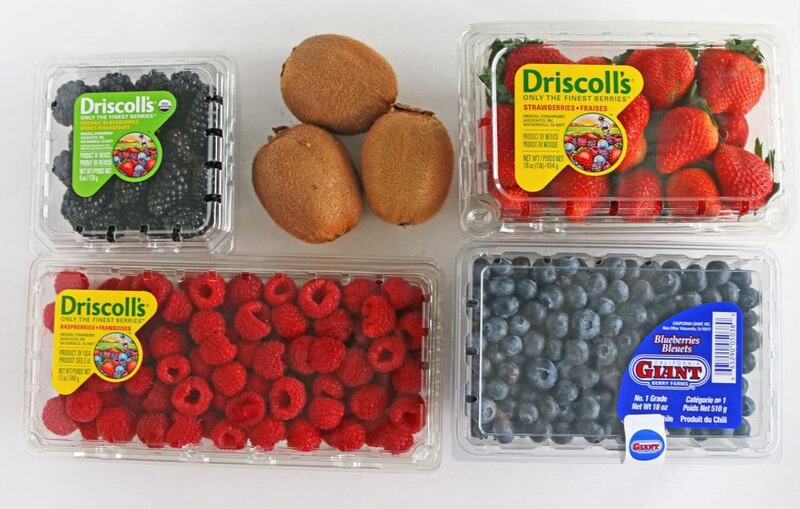 You may use whichever kind of fruit and as much of it as you like. (As you can see I love a lot of fruit.) Then place the second meringue layer on top of the fruit and repeat the same steps. 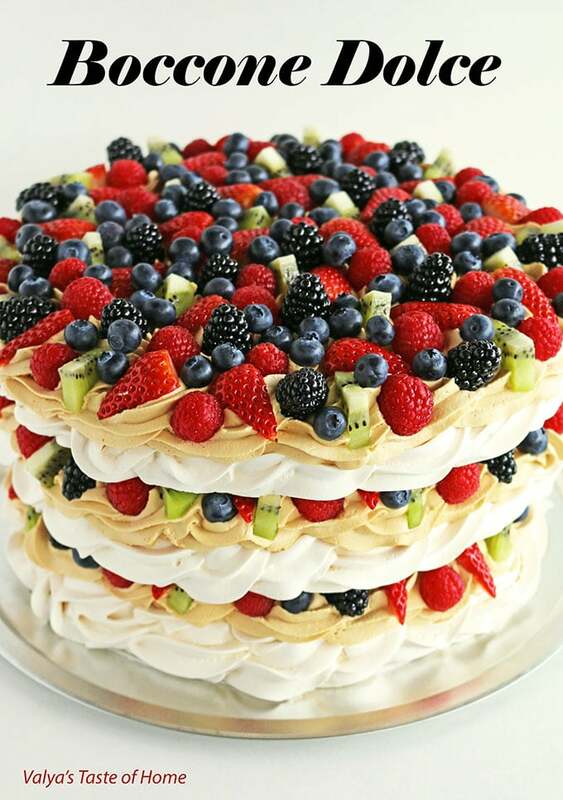 Finally, place the third layer on the second, repeat the steps once more and top it off with a nice load of fruit! Mmm…mm…good! Fill a piping bag with meringue, about ¾ full. Turn over the circular parchment paper cut outs (so the pencil mark is on the bottom side). Pipe meringue out in moon shapes (reversed letter “c”) overlapping each other to form a large circle along the visibly traced circle. Then fill in the middle. Level out the inside meringue, leaving the outer circle untouched. Repeat the same steps with all 3 parchment paper cut outs. Trim one of the previously used parchment paper cut outs along the traced circle and place on the serving platter to assemble the cake on. (This is optional but handy to prevent the platter from scratches during slicing). Spread a smidgen of cream under the paper to prevent the cake from sliding off. Place the first meringue layer on the paper. Spread about ¼ cup (70 g) of Nutella (you may use more or less, depending on how much you like). Fill about 1/3 of the cream into the same piping bag with the same tip you used to pipe meringue. Pipe out the cream in the same manner as the meringue layers. 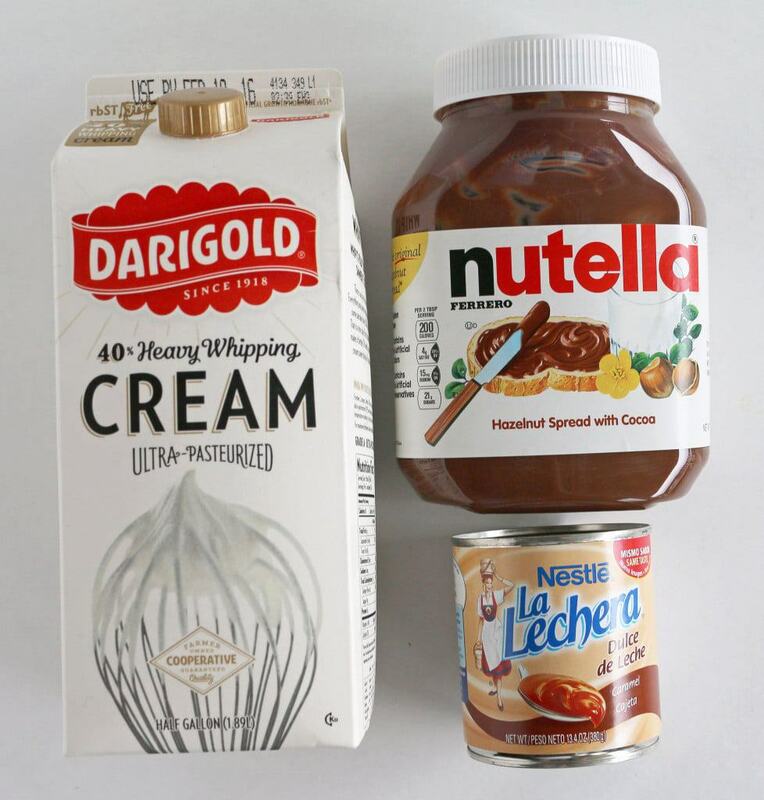 Fill in the middle and cover the Nutella. Spread out and mix up (rinsed, dried and cut) fruit on top of the cream. 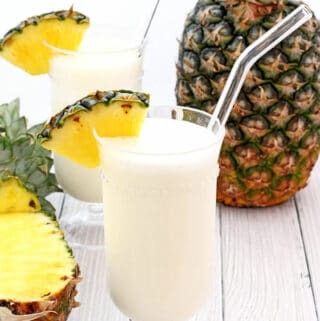 You may use whichever kind of fruit and as much of it as you like. (As you can see I love a lot of fruit.) Then place the second meringue layer on top of the fruit and repeat the same steps. Finally, place the third layer on the second, repeat the steps once more and top it off with a nice load of fruit! Mmm...mm...good! PS. Slice and serve one layer at a time. First, the top, then the second layer, once the top is gone, and then the bottom layer. The slice shown above is much too large a portion for a single serving. Ooh, la, la! This is one amazing candy cake! 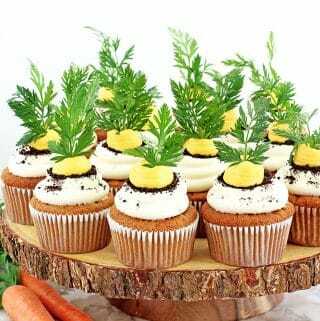 Delicious and beautiful in pictures! My oh my!!! No words! Oh wow!!!!! The pictures are amazing! Thank you for sharing this recipe with us! Valya do you think I can skip the fruits? 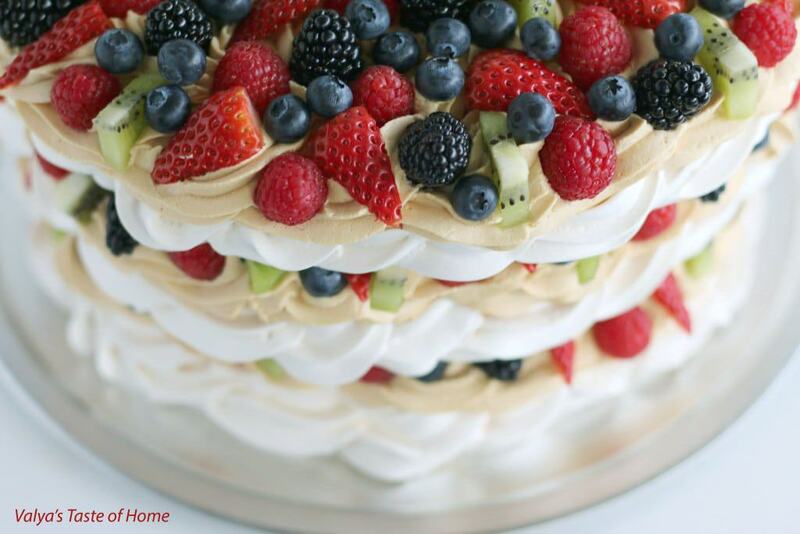 My husband is not a big fan of fruits in cakes but he LOVES meringue! You are very welcome Olga! Enjoy! 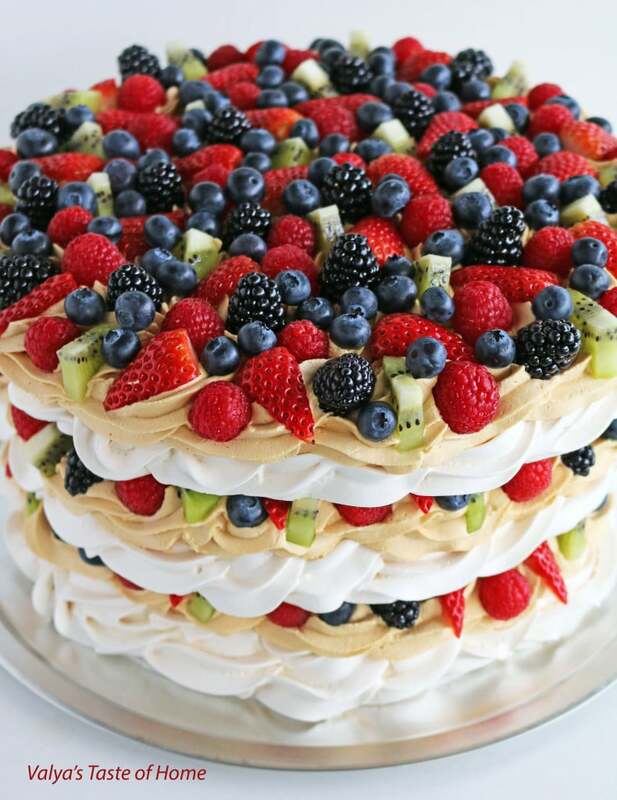 You can assemble it any how you like it, but the fruit adds so much taste and beauty to the cake. What a beautiful Cake. I need to make it someday and I will follow your steps. I’ve never made this type of cake yet. You won’t regret trying it out. I am so obsessed with this cake. Yum This cake looks amazing!!! What if I leave the dulce de leche out of the cream and instead add some powdered sugar.. Do you think that would be fine? Absolutely gorgeous presentation! Thank you so much for sharing it with us!! 1. 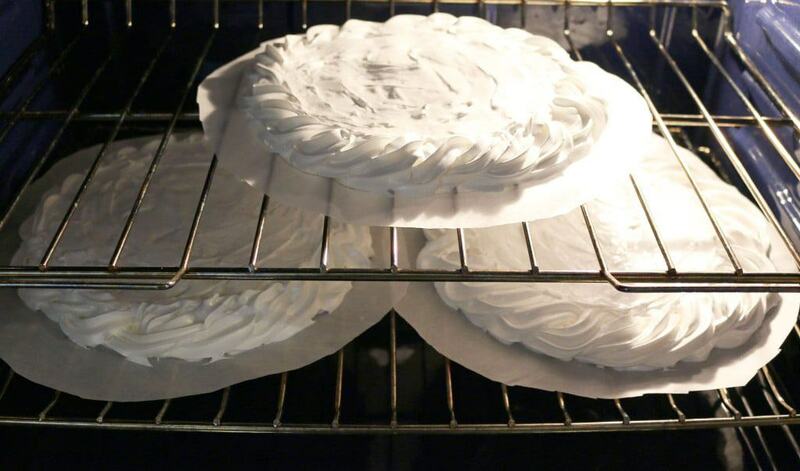 I cool meringue layers in the oven, because they tend to crack from sudden temperature change. 2. It depends how soft you like the meringue to be. I don’t like my really soft and not hard that they’ll crack while slicing. About 5 hrs. 3. I don’t like melted/soft cream, so I refrigerate the cake right after assembling. 4. Yes I do use room temperature home raised chicken eggs. 5. I like to use fine sugar granules, because it speeds up the beating process and doesn’t leave sugar granules on the sides of the mixer bowl. I’m sorry about that. You may need to adjust your oven temperature. wow!!!! You’re too nice to share this recipe with us! Thank you! What r u doing with all of those yolks? Great question!!! 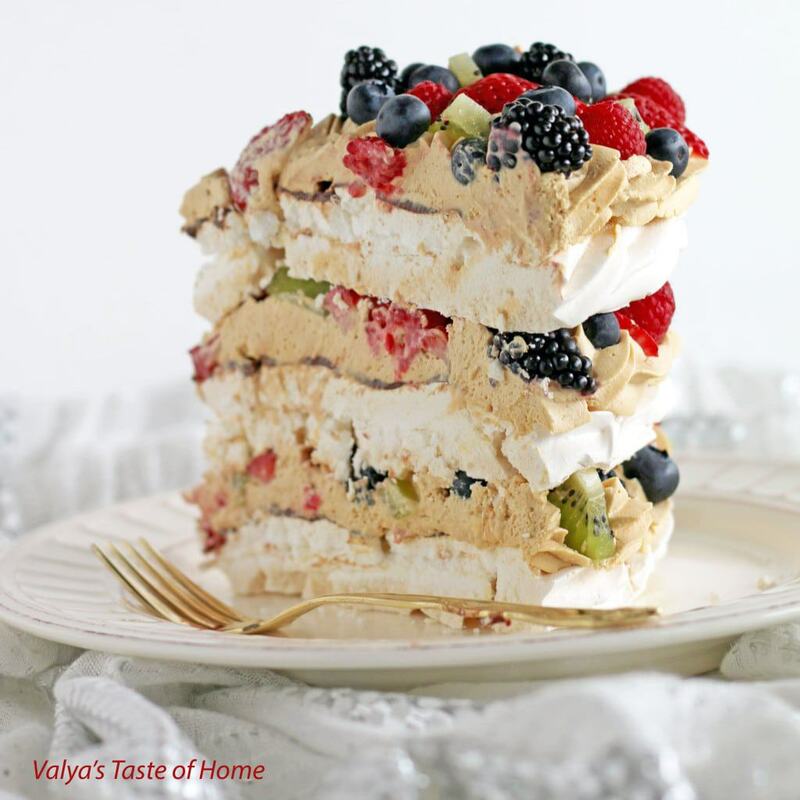 If you make Napoleon cake than that “zavarni” cream requires about 9-11 egg yoks. You can refrigerate covered yoks up to a week until ready for use. This cake is beautiful. Can’t wait to try it. We pay $10 a slice at a local bakery. Aww…, that’s sweet. The cake is “no word to describe” delicious. We’ve made it countless times and never fails, stays in the fridge for over a day and taste the same and doesn’t get soggy. Thank you so very much for such an amazing review Tatyana. Gods blessings to you family! This is one of my family’s favorite cakes. The taste is amazing, made it about 4 times already & each time I get great feedback. Last time I made this cake with 6eggs instead of 12 and had it in the oven for 4hours, it turned out perfect!! Thank you Valya for your advices when asked! This cake is definitely DELICIOUS and worth making! Aww…, so smart of you! I’m glad your family liked it. It’s one of my family’s favorite as well. I really appreciate your feedback Liana. Hi. This cake looks gorgeous. I am planning on trying your recipe for this upoming weekend, but I know that I will be very busy towards the end of the week. 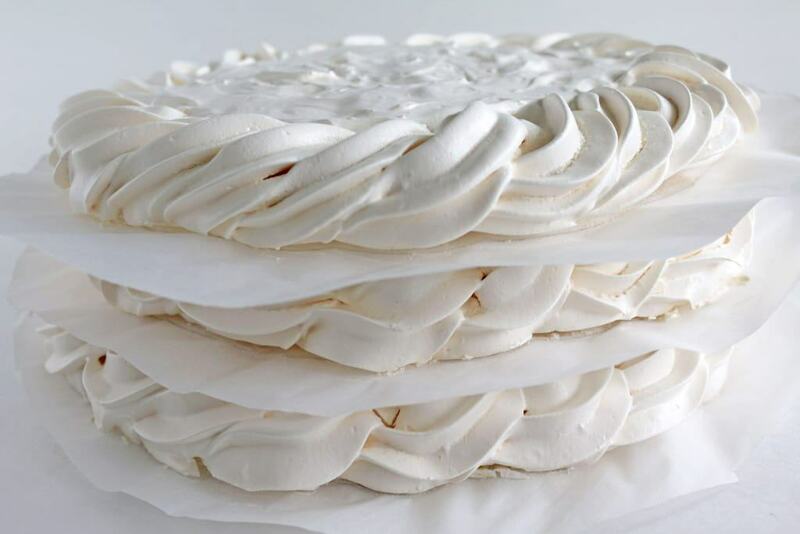 Do you know how much ahead of time I could bake those meringue layers? Hi Angelina! The meringue should not crack at all since it gets piped with room to expand (its ok for it crack if it would be placed as a one piece like a pavlova). I’ve always baked it on parchment paper placed directly onto oven racks. It may take longer to bake if the oven temperature is reduced. Give it try again and see if that was due to eggs. Make sure the eggs are fresh too. Hi dear Valichka! I was looking for a meringue recipe for kievskiy tort. I am thinking about a 10 0r 11″ cake. I would like to use this recipe but would like to use 6 eggs instead of 12. Do you have any advice on how much sugar I would need and also how long to bake the layers? I would like to achieve the same great result. Please help. Maybe you can recommend a meringue recipe for Kiev cake? Will be waiting for your advice. Hi Lena! 6 egg whites and 2 cups of bakers sugar is fine to use for 10 inch cake. When you pipe the meringue make sure it’s about 1/2 smaller in diameter then the cake it self as the meringue will expand during baking. Also, reduce the baking time to 4 hours instead of 6. Thanks for such a sweet word’s!? Hi Valya! I followed your advice and everything turned out perfect. 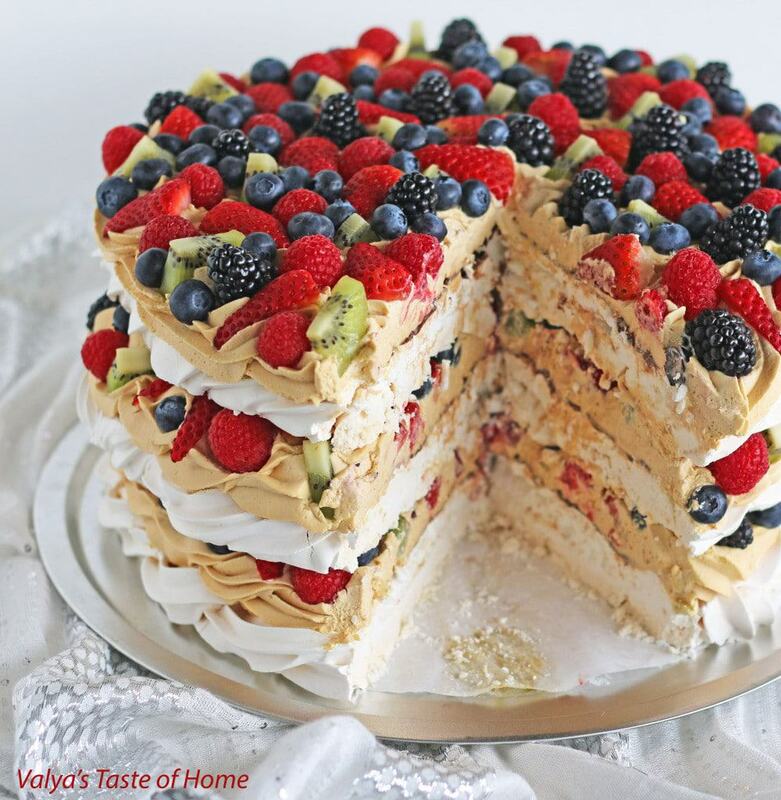 I got two meringue layers for my Kievskiy cake. It baked to total perfection!!! 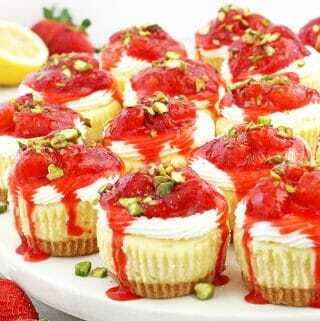 I always had such good result with all your recipes that I’ve tried. I had a good feeling this will work out fine. Thank you for sharing the tricks and all the details. And Птичье Молоко! I bet it’s gonna b good!!! Saw your picture with your daughter on Instagram. You girls are such dolls! I am sure you guys enrich so many lives by all you do. Oh, yeah! I had that recipe requested multiple times. I will get to it eventually. ? Thank you! I cannot believe how fast time flies! Seems like it was just yesterday when Elona was a baby, and now she’s all grown up. My New Year’s goal is to post a picture of a birthday child of the month. So, Elona ended up being the first one this year. ? We are WA ppl!!!…? Hi Valya! I love this cake, made a few times already. But mine doesnt turn oit so pretty. How do “draw” it?? Do you have a video on how you do it? I’ve done it at least 7 times but doesnt look gorgeous like yours. Thank you so much, i’ll Patiently will wait for your video! 🙂 I absolutely love this cake and so is my family! Thank you again! Hi. That cake looks extremely yummy! However, any suggestions for what to do with all the egg yolks? Lemon pie or lemon curd recipes. Thank you for the reply. The Lemon Pie looks delicious. Will now try both recipes!